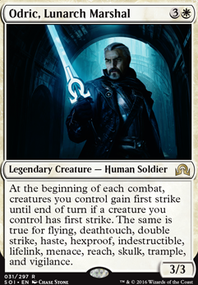 If I have 2x Oblivion Ring, and 1 Captain of the Watch, can I make infinite soldier tokens? Angel of Glory's Rise is expensive but reanimates all the Petitioners. Altar of Dementia + Fiend Hunter + Angel of Glory's Rise / Sun Titan = Infinite mill, also a handy sac outlet. One of the things I failed to really notice initially with your deck is that you produce a lot of +1 counters, Mirror Entity wont cause creatures with +1 counters to be sacrificed as a state based effect for having base toughness set to 0 since their toughness will be 0 + the number of +1 counters. I guess in short be aware if your building the reanimation loop I mentioned before when adding +1 counters. Another good add to consider is Guardian Project , play creatures draw cards cant go wrong with that. I would change out Heron's Grace Champion and Banisher Priest as they don't search or seem as critical as some of the others. Mikaeus, the Lunarch is kinda slow I would consider Ulvenwald Tracker as for its cost its kinda mean. You seems to have alot of + power/Toughness effects and without a reliable sacrifice outlet you may not get much use out of Mirror Entity , although Saffi Eriksdotter I think is still a VERY good add with Angel of Glory's Rise or Sun Titan and more so if you add Altar of Dementia for unlimited mill. 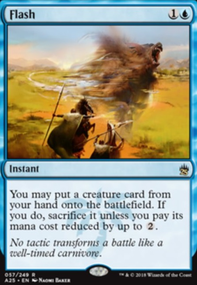 Don't know how I missed this but Serra Ascendant , its on theme with the angels and is a scary one drop I would replace Hamlet Captain for it. I do not know your meta but I think a better swap for Spear of Heliod is Lifecrafter's Bestiary as it helps you power through rough games by helping to keep your hand full and filtering your draws. Try adding Saffi Eriksdotter and Mirror Entity , you can combine it with Angel of Glory's Rise and Fiend Hunter / Saffi Eriksdotter for a unlimited human reanimation. You have most of the pieces already, I run a setup like this in one of my decks and its pretty funny to have up as anything less then exile or tuck effects cannot clear it out. 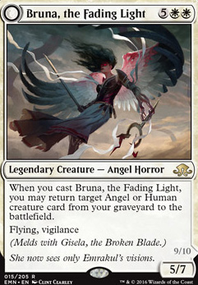 EDH_Fanatic For that combo you also need Eternal Witness and Angel of Glory's Rise meaning they both take the same number of slots. Could someone please explain why the angel of glory's rise combo is better than the Muldrotha combo. They both take the same amount of slots so all you are doing is switching out Muldrotha, the Gravetide , Phantasmal Image , and Necromancy for Angel of Glory's Rise , Eternal Witness , and Auriok Salvagers . In both combos there is only 1 not totally dead card in Phantasmal Image and Eternal Witness , so why is one combo preferable to the others? SK00MA - Angel of Glory's Rise gets Dread Return ed to bring back salvagers and Ewit off the Hermit Druid activation or the Protean Hulk .